I have a very neutral living room and love touches of black. Painting the lampshade black works so much better in the room than the boring beige one! I’m thinking of writing on the lampshade at Christmas! So fun! Today’s post is easy and all about having you think of little ways to change things up in your home! And a lampshade is the perfect place to start! Here’s how easy it was to paint a lampshade! I had a flat black chalkboard paint in my paint closet so I thought it might be fun to use that paint! I used a round paintbrush to paint 2 coats of paint on the lampshade! Here’s how it looks when it is done! I bet if you looked around your home you could probably find a boring lampshade that could be upscaled with a little paint! 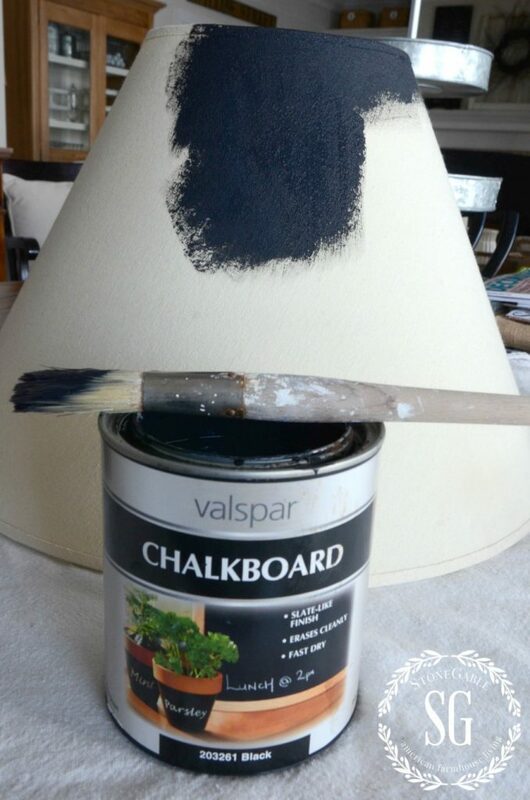 Did you know that chalkboard paint comes in lots of colors? Make a little change that makes a big, big difference! Now, tell me if you have a lamp that needs a lampshade facelift? What color would you use? You might like to see another lampshade I upcycled. I just covered it with printed burlap! This was amazingly easy too! 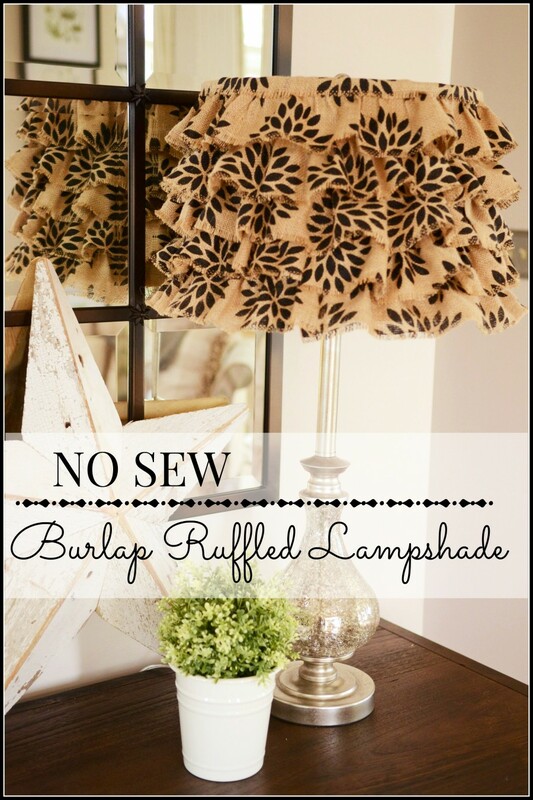 Click HERE to see my NO SEW BURLAP RUFFLED LAMPSHADE. Remember to pin this to your DECOR or DIY Pinterest board. 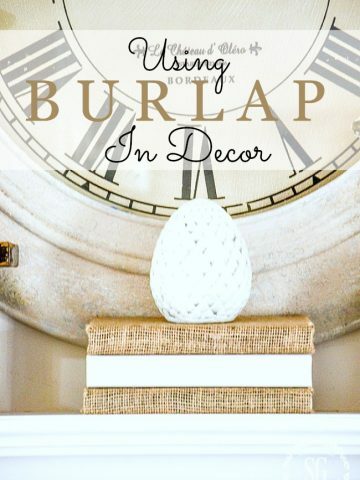 You can follow me and see all the decor I’m pinning HERE. I am a new fan of your blog, Yvonne! Your style and taste is lovely and timeless, comfortable yet sophisticated. I have a question about painting the shade. I did two matching white fabric lamp shades & painted them black as well. They look awful when I turn the light on! So streaky and uneven and the shade ended up with an unpleasant rough texture. This was a few years back & I didn’t know about chalk paint. I used black acrylic paint and even mixed in a fabric medium to help soften the final results! Any ideas?? Welcome to the StoneGable family, Carey!!! 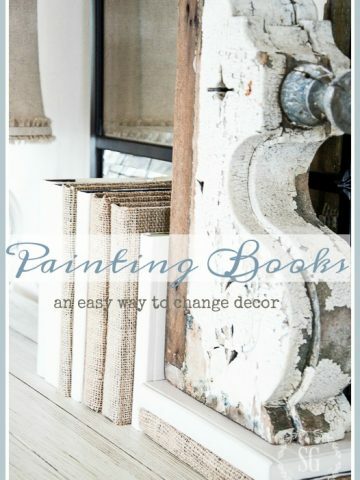 Why don’t you try using chalkboard paint? It’s thick and a tiny bit grainy. It really worked well! Love, love, love it! 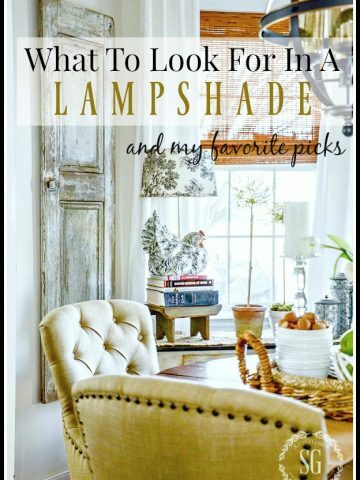 !….I love the black shade with the vignette!…..
Love both lampshades! I love the sheep; I’ve been looking for sheep about this size, standing or lying down. Do you have a source? Thanks! Love the lamp transformation – such a dramatic change that made a huge difference! I am interested in painting a lamp shade that I have (thankfully I hadn’t thrown it away yet!) and was wondering if any type of paint would work or if a certain one works better. The shade I have is a fabric shade, but the inside is sort of “papery”, if that makes sense. Any advice you could give would be appreciated! What a great idea! It looks fabulous! Plan to copy you- I have just the shade that would look so much better in black- Thanks for ALL of your great tips, recipes and ideas! Well,love your lamp shades,i noticed someone ask you about your book covers,i was wondering the same thing ,so thanks. Wow that turned out great! 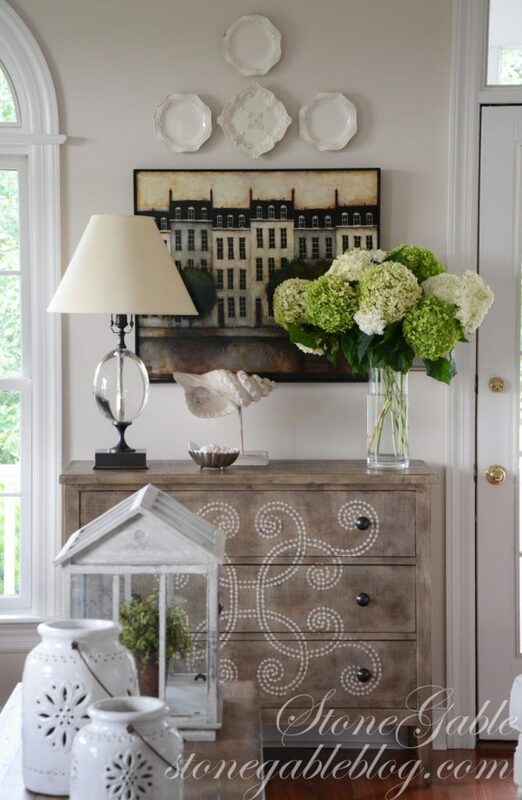 The lamp shows up so much more with the pretty black shade and it compliments that amazing artwork! Such a small change that makes a great impact! Thanks for sharing. Does your lampshade have a fabric or paper cover? The shade has a fabric cover. It came with the lamp. Wow….looks beautiful 😉 the black makes a nice statement. 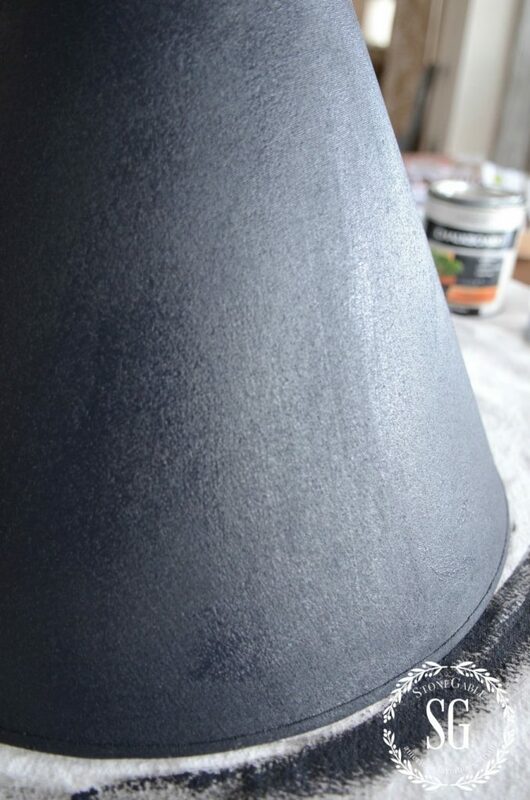 I painted a buffet lamp shade black on the outside and used metallic gold on the inside. The lamp is on top of our piano in the living room and gives such a nice glow! Now that sounds gorgeous, Lynn! Wow! What a difference! You are soooooooooooo clever~~~glad I subscribed to your blog. Your creativity never fails to amaze me, Yvonne. Changing that lampshade to black is a winner! Another brilliant upcycle Yvonne! Love the black shade. What a stunning lamp – and your updated shade takes it over the top. Truly inspired. You should let Restoration Hardware know – they could improve the sales of that lamp with just a chalkboard shade!!! I am always amazed at how beautifully you do your blog. Thank you. I have a question about the size of the lamp shade or the harp on the lamp. How much of the light socket should the lamp shade cover? I usually try and cover the socket, but would like to learn if there are other options and options. I’m certainly not an expert in this area, Joanne. But common sense would say that none of the socket should show. I think the base and the shade should stand out without showing the “workings”. Hope this helps. 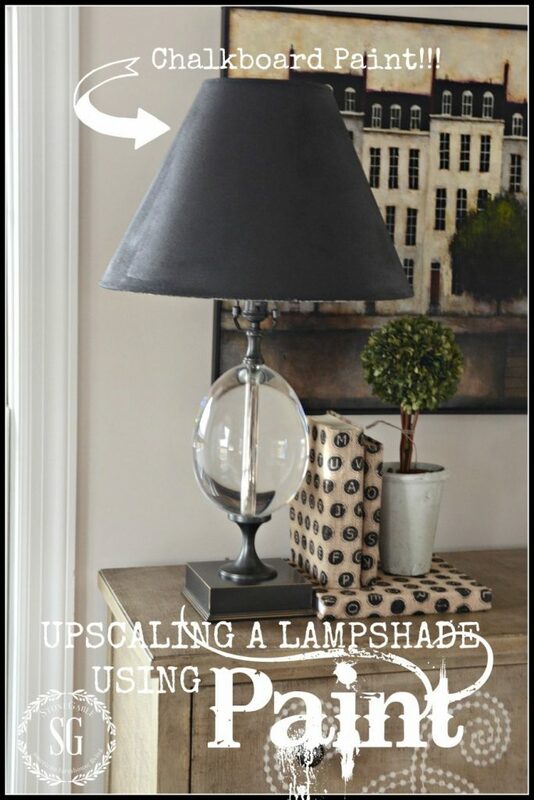 Loved the repurposed black lamp shade. The chest it is sitting on in the picture is so pretty. Did you paint the design on it? If so could you do a tutorial on that also along with the covered books? Did the chalkboard paint streak at all? 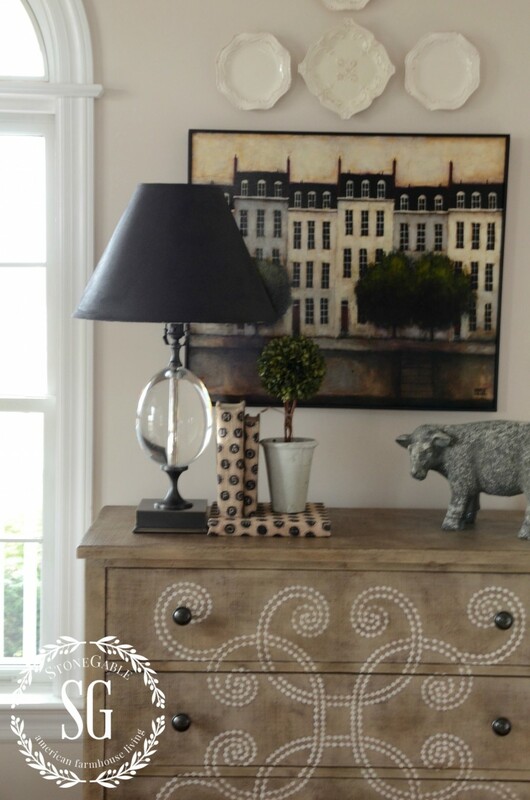 The chalkboard paint worked great with the fabric of the lampshade! Love the black! Definitely more dramatic and beautiful! Love the transformation. I did this to an old lamp and shade also, wish I had taken a picture. Are your books covered with fabric? Can you share that tip please! 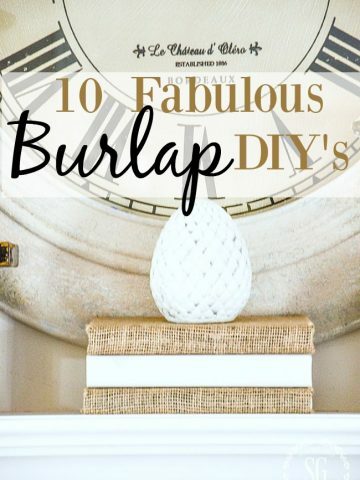 Hi Ellie, My books are covered with burlap and it’s so easy to do. For some reason I can’t put the link here. Google. StoneGable burlap covered books and the post should come up. And you are right it sure does make a difference. I love seeing thatFrenchy print in your photos. Do you mind sharing its source? The black shade does look so much better ~ it really shows off your nice lamp. I’ve been moving around lamps and lamp shades in my family room and it is amazing how much difference it can make in a room! The black shade looks perfect with your painting. I’ve spray painted a couple of shades and they work great. What a fabulous idea! And yes, I have some pretty boring lampshades at my house!